The Small Business Administration (SBA) has launched a first-of-its-kind tool on the federal agency’s website that allows entrepreneurs looking for a small business loan to get matched with an SBA lender. The Small Business Administration (SBA) has launched a first-of-its-kind tool on the federal agency’s website that allows entrepreneurs looking for a small business loan to get matched with an SBA lender. The new tool, called LINC (Leveraging Information and Networks to access Capital), requires small business owners to fill out a simple online form with 20 questions and connects them with lenders within 48 hours. By directly connecting with prospective borrowers, the agency aims to provide more guidance and ensure more capital is reaching U.S. entrepreneurs. After filling out the form, a borrower’s answers will be blasted out to every lender in that borrower’s county, as well as to other lenders with a regional or national reach. Lenders will respond within 48 hours — with no fees or commitment required. “LINC will roll out in waves. It will begin by connecting small business owners with nonprofit lenders that offer free financial advice and specialize in micro lending, loans in our Community Advantage program, and real estate financing. In the longer term, we’ll look to add more traditional banks that offer an even wider array of financial products,” says Contreras-Sweet. 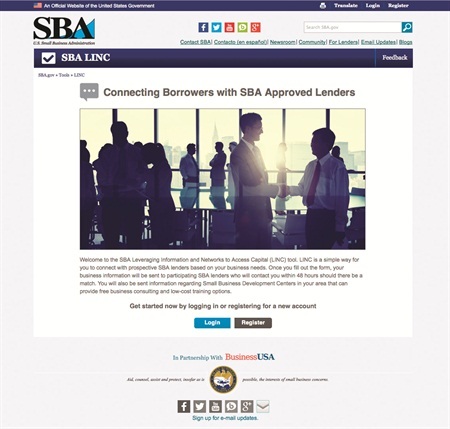 For more information, go to www.sba.gov/tools/linc.